The last time Virginia Tech made it to the round of sixteen in the NCAA basketball tournament, the game was broadcast in black and white; Neil Armstrong and Buzz Aldrin might have watched in anonymity because the pair were still two years away from walking on the moon; Frank Beamer was just starting his career with the Hokies football team — as a player. For a team that has only briefly flirted with national relevance in the past, perhaps the only thing more surprising than being in the Sweet Sixteen is that, as a four seed, this was expected. 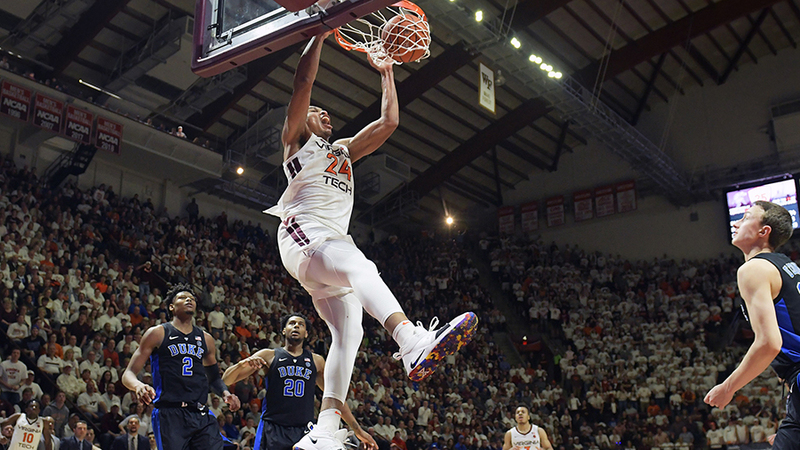 Contrast that position with that of the Hokies' opponent, Duke, who will be playing in the Sweet Sixteen for the 27th time since the last Virginia Tech appearance. In that same time span, the Blue Devils have more nationals championships (5) leading to this season than the Hokies have NCAA tournament wins (4). But none of those past insignificant Virginia Tech squads or tournament-favorite Duke teams will take the court Friday night. Instead, a region's one seed will play its four seed, and to anyone without an emotional interest in either team, it is a winnable game by either. This is the round where the tournament gets intense, nearly all weaker teams have been eliminated, and everyone remaining has some legitimate chance of going all the way. By the (Advanced) Numbers takes a look at what to expect when Hokies dance with the Blue Devils.